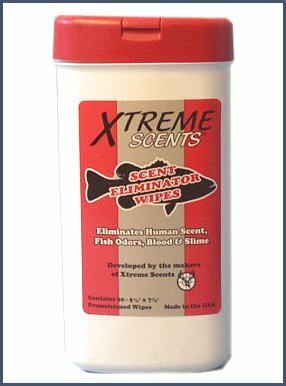 In addition to fishing scents, Xtreme Scents also offers Scent Eliminator Wipes that are ideal for many different uses. Remove the human scent from your hands so it is not transferred onto baits and lures. Reduce fish odors from your hands and equipment. Can be used to remove fish slime and blood from the interior of your boat. Available as shown with 20 wipes per container (white container shown). Prices available on request - may be pre-ordered.